Adam Peaty has succeeded in becoming Britain’s first ever three-time quadruple European champion. The Men’s 4x100m Medley Relay was his fourth gold at the Glasgow 2018 European Championships. He was joined by team mates Nicholas Pyle, James Guy and Scotland’s Duncan Scott. Between the four of them, they set a new championship record of 3:30.44. Peaty said: “Britain is looking strong at the minute individually and in relays. 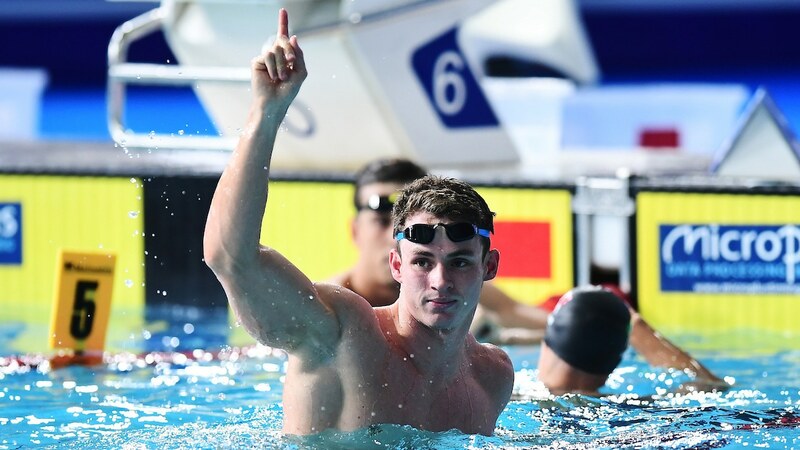 “Sometimes, I’ve got too caught up in the outcome with people talking about world records as soon as I did the heats and asking if I was going to get the four gold medals. The silver medal went to Russia who touched in 3:32.03 and Germany got third place after clocking 3:33.52. Peaty also picked up a trophy for LEN’s athlete of the year. In the Women’s 4x100m Medley relay, a British team made up of Siobhan-Marie O’Connor and Freya Anderson along with Welsh team mates Georiga Davies and Alys Thomas brought home the bronze medal. The gold medal went to championship-record setting Russia with a time of 3:54.22 and the bronze went to Denmark, who clocked 3:56.69. The medals came in thick and fast from the beginning, as seven medals were won by British athletes out of the nine races. Ben Proud won the 50m freestyle, having set a new championship record in the semi-final yesterday. Proud’s time was slower than his personal best in the semis, which made him the third fastest man ever over the distance, but he highlighted this as an area to improve on going forward to Tokyo. “The swim itself was a little disappointing, so I have mixed emotions,” said Proud. “Nowadays it’s about constant improvements for me, so to have gone slower in the final than in the semis is something I need to look at for future meets. Silver went to Kristian Gkolomeev, of Greece, with a time of 21.44 and third place went to Italy’s Andrea Vergani (21.68). Imogen Clark secured a silver in the 50m Breaststroke in her first outing for the British team. She finished 0.53 seconds behind Russia’s Yuliya Efimova with a time of 30.34. The bronze medal went to Italy’s Ariana Castiglioni, who touched in 30.41. Max Litchfield added to his bronze in the 200m IM with a silver in the 400m IM (4:11.00). He pushed David Verraszto in the final length but couldn’t edge past the Hungarian in the final few metres (4:10.65). Joan Lluis Pons Ramon, of Spain, had to settle for bronze with a time of 4:14.26. In the 400m Freestyle, Holly Hibbott secured her second medal of Glasgow 2018 after coming third with a time of 4:05.05. Ellie Faulkner come in eighth in the same race. Another bronze added to the total on the final day of swimming at Glasgow 2018 was James Guy. His time of 51.42 in the 100m Butterfly left him 0.78 seconds behind the race winner Piero Codia. Codia set a new Championship record of 50.64 to take the gold and Mehdy Metella of France secured silver (51.24).